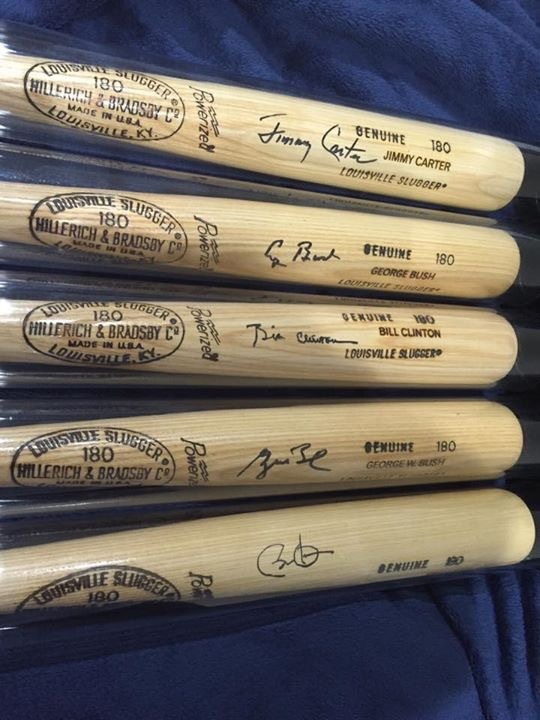 Since obtaining a signed baseball bat from President Clinton – I have been able to acquire signed bats from the (3) other former living Presidents (Jimmy Carter, George H. W. Bush and George W. Bush. Now the conundrum of how to get the current President, Barack Obama to sign a bat for this special niche in my collection. In the summer of 2013 – I attended a fundraiser for then Congressman Tim Bishop in the Hamptons on the east end of Long Island. The special guest that day was House Minority Leader Nancy Pelosi. Leader Pelosi could not have been nicer as she actually flipped and served pancakes that morning. She took a liking to my two boys and started remarking about her own grand kids. When she was done cooking – she kindly came over and took a picture with my family and signed a baseball for my collection. I floated the idea to her that I have a very special collection and could use her expertise to help me with a huge favor – obtaining the current president’s signature on a baseball bat. She smiled and her staff who were taking the pictures of her and my family said please get in touch with them and they gave me their business cards. As much as I am a believer in positive thinking – I knew this was a huge task to ask anyone – in a powerful position let alone Nancy Pelosi. I was thinking; at least I tried. Sure enough I followed up a week later and her staff could not have been nicer. They asked me to please prepare a letter asking the President to sign my bat and letting him know all about my unique collection and the previous museum exhibits that I have had. They wanted me to send the bat to the White House via USPS mail with the aforementioned materials on my collection. I knew it would take a few weeks to clear security and such. As I started to follow up with Leader Pelosi’s staff – it became apparent that this was a huge deal to try and get the President to sign my bat which I had engraved to match my other signed and engraved bats of the former Commander in Chiefs. About a month or two after I mailed the bat – I followed up again with her staff and they advised me that this would be a long and arduous process. I was not concerned as this was Nancy Pelosi who was leading the charge for me. About 6 months later – I became even less optimistic – especially when I got a call from the Leader Pelosi’s staff that the bat which I sent to the White House was evidently lost in the mailing process. I could not believe it! After all this planning and getting the bat engraved – was this not going to ever happen? They assured me not to worry! In May of 2014, when I was headed to Washington, D.C. for our annual meetings with our Members of Congress – they requested that I personally bring another bat to Leader Pelosi’s office in the Capitol Building. I deftly packaged the bat in sturdy tube and proceeded to fly to D.C. Upon my arrival in D.C. – I immediately hailed a cab to the Capitol Building and proceeded to walk up to the iconic building with my large tube in hand. No less than 10 Capitol Hill Police stopped me and questioned me as to what I had and where I was going. Luckily, Leader Pelosi’s staffer agreed to meet me outside the staffers entrance. She could not have been nicer or more accommodating and assured me that they would try their best to get this special request done. And that they would hand deliver the bat to the White House. Every few months I would check in with her office and they would say, nothing yet – but we will keep you posted. This went on for about 18 months until that magical phone call was received recently stating that President Obama had just signed my baseball bat. I was thrilled. This was a huge accomplishment. Not everyone can get a sitting President to sign a large object like this. President Clinton was extremely generous to me while he was in the White House and signed many copies of his 1996 book, Between Hope and History for my friends and I. But that was a book – this is a baseball bat.